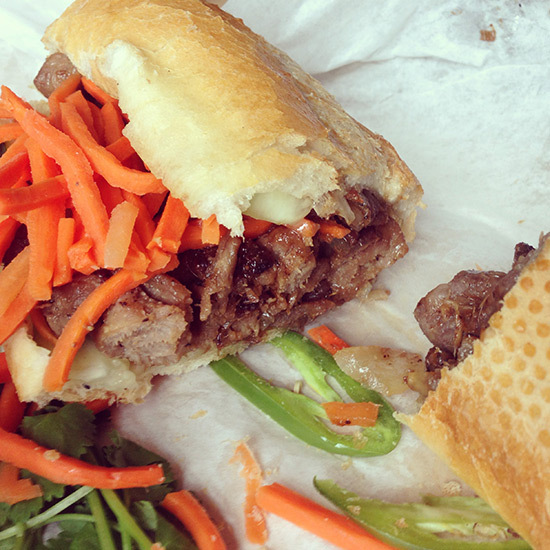 Vietnamese food is rarely awful, but truly great restaurants are also hard to come by. 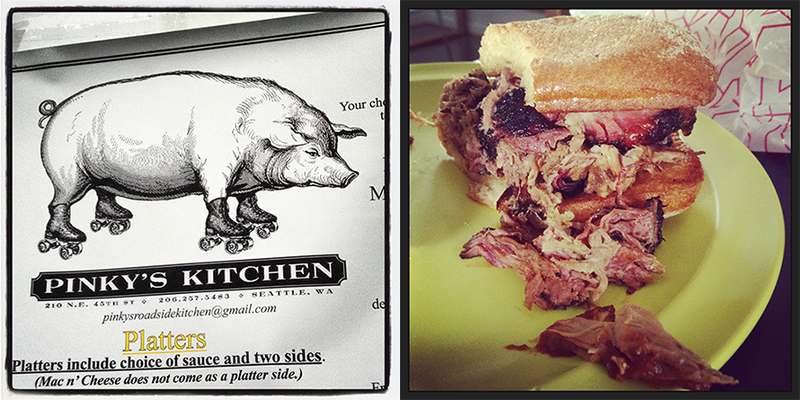 We stumbled across The Monkey Bridge after an appointment in Ballard and were wowed by the juicy, flavorful bahn mi. 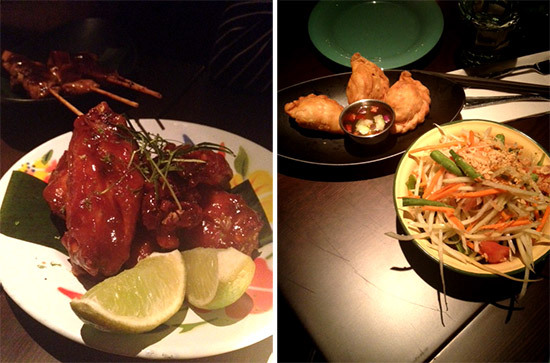 Pork and beef were equally noteworthy and indicate that their larger menu is worth another visit. We did take out but the space in inviting and casual and the staff friendly. Friend Shaun made one important recommendation when we announced our move to Seattle – get a crumpet at The Crumpet Shop. 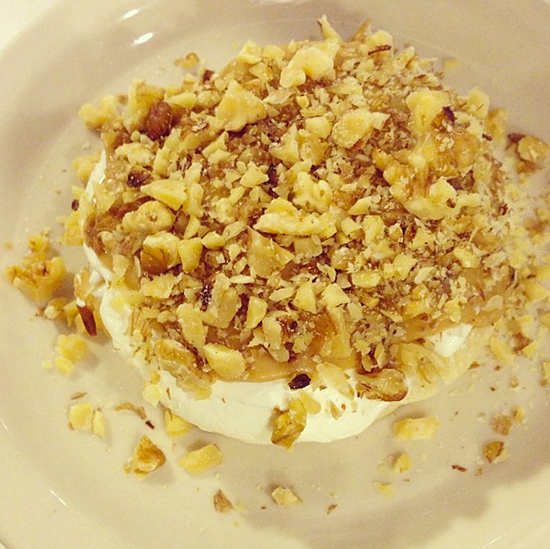 I decided to have my first as simple as possible with just butter and honey while Jim went for it with an impressive creation of maple butter, walnut, cream cheese. While space is tight, crowds ebb and flow. They also serve scones and coffee. We’ve been told the closest thing to Brooklyn in Seattle is Capitol Hill. Meaning: hipsters and their hip bars and restaurants dwell there. One restaurant always associated with the neighborhood is Skillet Diner. Notorious for long lines, famous for great food in the “now” – like bacon jam bloody Mary’s (which was very good). The simple but considered presentation and delicious chicken fried steak I had – big, tender cuts of choice meat with a salty, flavorful crust – did indeed remind me of home and made me feel better about all the great restaurants we left behind there. The entire menu was full of promising dishes with lots of pork belly, fennel and beets. Like so many places in Seattle, Skillet diner is exceptional but there was not a promised hipster in sight. 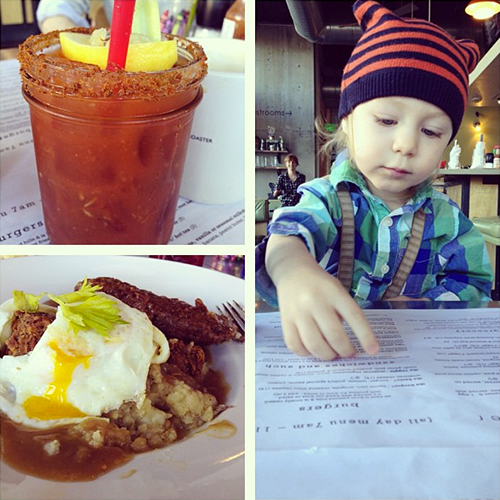 I kind of wanted to see people that dress up for brunch but at 8am, it’s families and olds. Same everywhere I suppose. At least there are no lines at that hour. How very lucky we are. While I thought good food delivery was a thing in our NYC past, we found that Seattle has a service called Eat24 that delivers from restaurants in the area all through an online system. Even better? We found some incredible sushi our first order out from I Love Sushi. It is the kind of sushi people always brag about on the Pacific Coast, the kind of sushi I have been aching for since we got here, the kind I want to take photos of each and every piece. While I can’t tell you anything about the actual restaurant, I can say that I Love Sushi is excellent. Not only are the basics covered and amazing (tuna rolls? fantastic. California rolls? a step above the usual) but the specials are always impressive. Take the Sushi Train Roll (pictured): pressed sushi w/ scallop, crab, flying fish roe, topped w/ seared salmon, sprinkled w/ sea salt, squeeze of lemon or the Northwest Samplers that feature nigiri made of fresh local fish. The Pike Place Market, arguably Seattle’s most famous destination, is too vast with too much to offer to write one entry based on one visit, so I will just start with the most life changing. It’s called Salmon Candy and you can find it at Jack’s Fish Spot. Located across from the one where they toss the fish featured on every travel channel show out there, it’s a friendly place that has fresh fish, a bar around back where you can chow on oysters, fish and chips, and clam chowder (to name a few), and bins of smoked fish. Salmon Candy was recommended by the man on duty and he certainly didn’t steer me wrong. 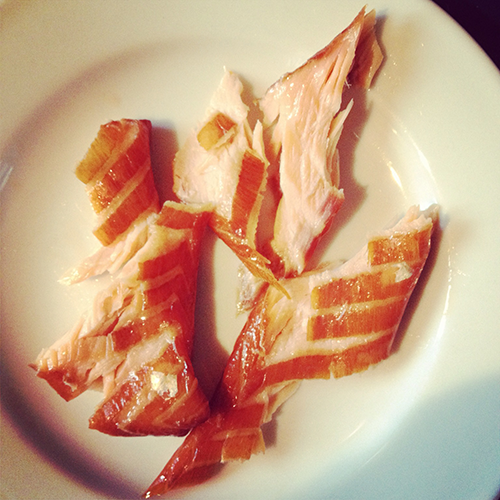 The best smoked salmon I’ve ever had. So good that I opted to send a pound to my mother in lieu of flowers for mother’s day. We arrived in Seattle a couple weeks ago (we are still settling, hence the lack of posts). We stayed at the comfortable and friendly Watertown Hotel until our things arrived. 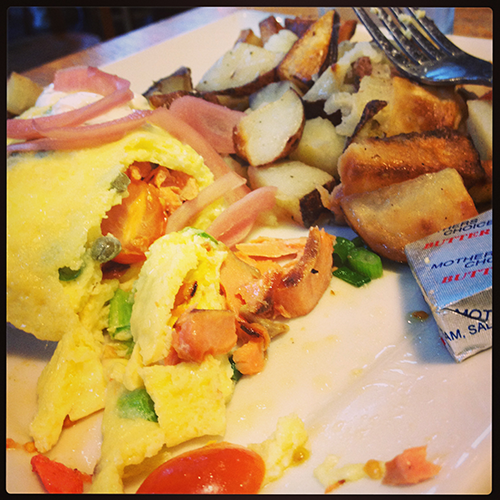 A few blocks away we found Portage Bay, an most appetizing welcome to our new home city. Everything we tried on the menu (yes, there were return visits) was delicious. They had Swedish pancakes, made with fresh, real ingredients that I didn’t have to embarrass myself with a trip to IHOP for! 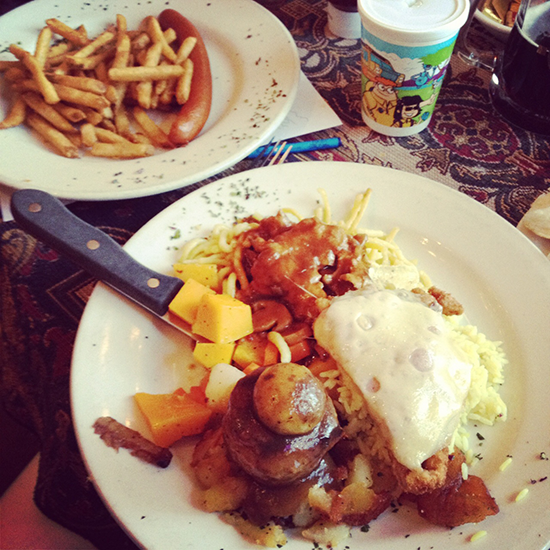 They had a vegetable hash that had Jim, yes Jim, shoveling vegetables into his mouth! There’s a fruit and toppings bar, a number of omelett options, and Benedicts of all kinds that will impress (I had to try the salmon, a food I’ll always associate with the Northwest since a visit here years ago) but the dungeness crab was remarkable too. The space is huge and child friendly (though admittedly I am coming from Brooklyn, where spaces tend to be pint sized and hating children is a new pastime) but I’ve read it can get very crowded with long waits on peak brunch hours. I imagine this will be a favorite of our family in the years to come as we settle into our new town. It’s service with a smile and incredible food with a conscious: ingredients are local and organic. After the false hope brought to us by this mysterious and never opened Ichiran, ramen has come to the Williamsburg/Greenpoint area. I’ve enjoyed Yebisu at the smorgasburg events, but am thrilled to have a brick a mortar location – albeit a tiny, stools only one – to warm chilled bones with (quite possibly) the worlds greatest dish. Is it perfect? No. Most notably the pork is a bit dry and tough where it should but tender. The noodles, though were perfectly toothsome. I tried the shoyu and while it was good the one that will have me running back as soon as I can book a sitter, is the miso ramen. Its broth had flavor and depth and even though I only had a few sips of my friends – its taste lingers in my mind. The staff is friendly, the house sake above average, and the price is right. While it may not be Ippudo (but that’s an unfair comparison) I am very happy to welcome the long awaited Yebisu to the neighborhood. Sips and Bites may be a wee sliver of a shop (I’d passed by it a few times without noticing) but it’s big on charm and boasts a great menu of sandwiches. While I look forward to trying most once I am no longer pregnant (darn that no deli meat rule! ), the tuna sandwich I’ve had is excellent. It doesn’t try too hard, but the flavors and mix of ingredients (black olive tapanade, anchovies and haricot vert to name a few) is far from boring. The baked goods are rotating and always great (we all enjoyed the homemade lemon curd pop tarts) and the tea and lemonades have been ideal thirst quenchers more than once during all this crazy heat. The staff is exceptionally nice – which is always a welcome and happy thing and there’s a great deal of charm and style to the interior. 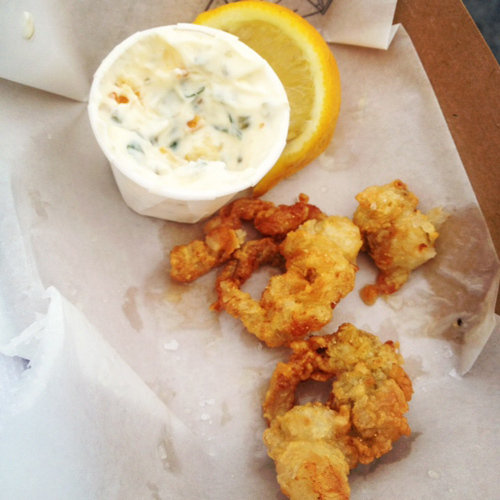 Shucks, the new fried clam stand at Smorgasburg was so delicious, I’m basing this glowing review off of a single bite snatched from mike’s dish. Never have I had fried clams so light and tender. Usually even good clams can be rubbery and taste heart-stoppingly fried. This will be a must on my next Smorgasburg visit. The brick and mortar ramen shop Yebisu has been eagerly awaited and delayed but if their cold ramen dish at Smorgasburg is any indication, it will be worth it. Toothsome noodles, with a delicate and refreshing splash of sauce, a perfectly semi cooked egg, and flavorful pork. This is a dynamite dish. I could eat it everyday. You just can’t resist the scent of truffles. And once you’ve caught the scent you can’t duplicate with anything else. Sorry, was that all too yuppie to say? Well, regardless it’s true. 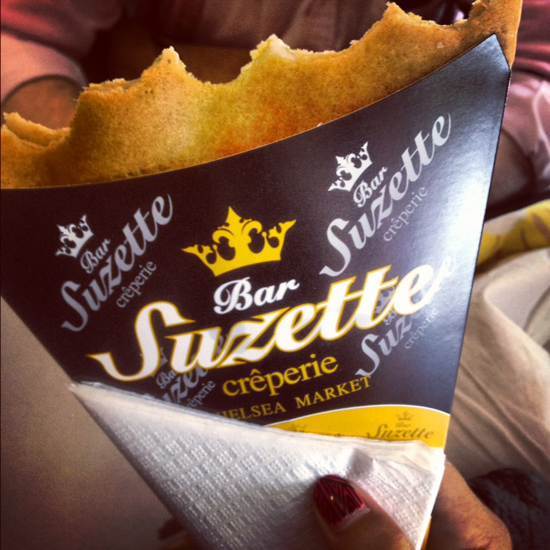 And when an after doctor appointment stroll took me to Chelsea market, Bar Suzette drew me in with truffle mozzarella crepes and I couldn’t say no. Luckily I’m so pregnant and sore and tired and hungry all the time that I didnt have to say no. Or explain the fact that it was merely a pre lunch snack. You normals out there can partake in this as a light meal. The stand is open earlier than many of the market restaurants too, in case you need a bite on the early side. The Red Hook Lobster Pound lobster roll is gauaranteed to be one of the best bites at smorgasburg but it’s also one of, if not the priciest at $16. Makes it hard to accept if you want to sample lots of goodies. So here’s a tip. For a mere (ha!) 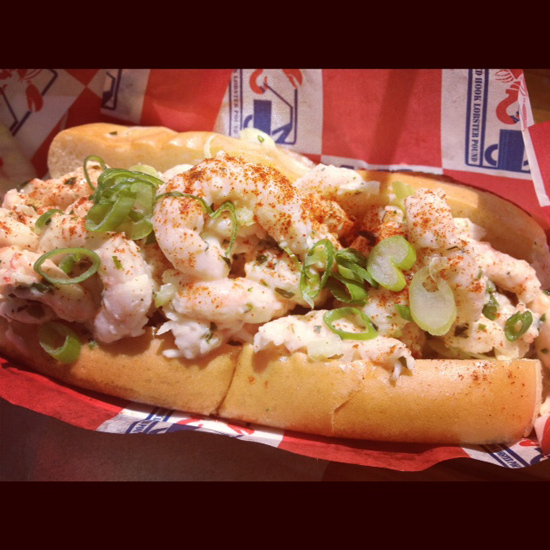 $10 you can enjoy their tarragon tinged shrimp roll which is arguably as good as their name sake sandwich. It’s a refreshing summer bite on these record breaking hot days. 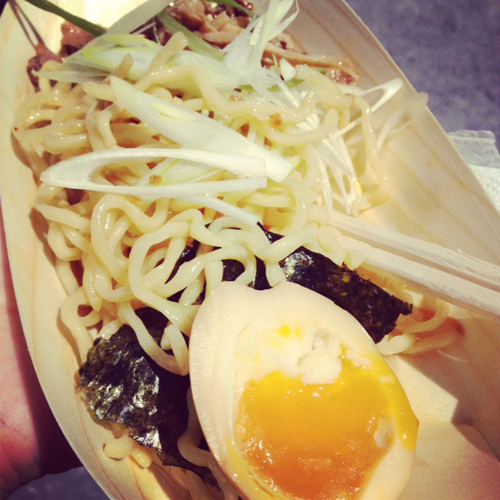 I felt like I was stalking Yuji Ramen waiting for them to open for business at Smorgasburg. 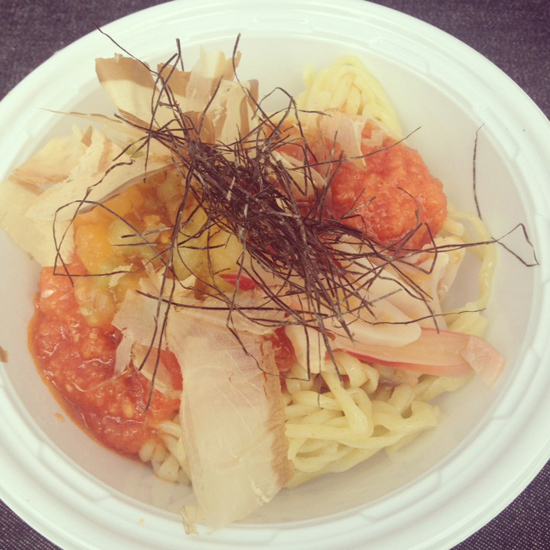 A recent addition to my favorite food fair, they offered a truly unique summer ramen dish: Cold noodles,tomato sauces, strips of marinated clam and other toppings. It was unlike any ramen I’d had and perfectly refreshing on such a muggy day. Yuji can also be found evenings Thursday-Saturday at Kinfolk Studios. Can’t wait to drop by next week to see what they’re serving.